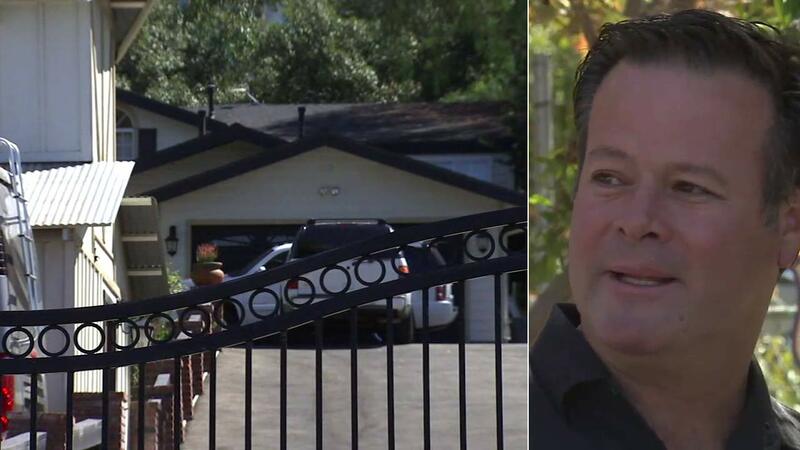 ORANGE, Calif. -- The deaths of the father and stepmother of former NASCAR driver Robby Gordon were being investigated as a possible murder-suicide after the married couple was found dead inside a home in Orange, authorities announced Thursday. The deceased were identified as Robert Gordon, 68, and Sharon Gordon, 57, the Orange County Coroner's Office said in a statement. Gordon's death was "consistent with a self-inflicted gunshot wound, and the death of Sharon Gordon was a result of strangulation," according to the agency. Orange Police Department officers received a 911 call from a neighbor who reported finding the bodies inside the home, owned by Robby Gordon, in the 1400 block of N. Kennymead Street around 5 p.m. Wednesday. The neighbor, who called police, was asked by a family member to go check up on the couple. A rifle was found inside the home. "I'm so sad and I can't believe it," Robby Gordon told media gathered near the gated house. "I'd like everybody to understand that this is very, very tough, and it's not only tough for me, but it's tough for my sisters Robyn, Beccy and my sister, which is Sharon's daughter, Hailey," he said. "It's going to be tough on all of us. He explained that when he moved to North Carolina to be a NASCAR racer, he had given his home to his father and stepmother to live in. "I grew up on this property my whole life. I learned everything about motorsports out of this little tiny barn over here," he said. The younger Gordon currently races in an off-road series he created in 2013 called Speed Energy Formula Off-Road, following the path of his father. Known as "Baja Bob," Robert Gordon was also an accomplished off-road racer. Robby Gordon said his father instilled in him a passion for motorsports and competition. "He taught me at a young age that 1 horsepower wasn't going to be enough," Gordon said. Neighbor Greg Saunders said everyone in the area knew the family. He said Robert Gordon had a horse feed business and would regularly drop hay off at neighbors' homes. Saunders said his wife worked out at the gym with Sharon Gordon, so they knew each other well. "The guy was so down to earth. He just delivered hay for all the people for their horses, you know, real nice guy," Saunders said. Investigators said they are not looking for any outstanding suspects. Robby Gordon has two sisters, Robyn, who also lives in Orange, and Beccy. He said he would speak about the deaths again once authorities conclude their investigation. "The truth will come out, what went down here," he said. The former NASCAR star thanked the racing and the horse-raising communities for their support. Racer Dale Earnhardt Jr., who has won multiple NASCAR championships, tweeted that he was praying for the Gordon family. "Hope they find strength and support," he said. Gordon's sister Beccy, is married to 2014 Indianapolis 500 winner Ryan Hunter-Reay. The driver tweeted Wednesday that his wife had given birth to a boy. Hunter-Reay would appear as scheduled in a weekend race in Sonoma County, Gordon said. The investigation was ongoing. Anyone with more information was asked to call the Orange Police Department at (714) 744-7444.